EDNA'S case was really a pathetic one. Like every woman, her primary ambition was to marry. Most of the girls of her set were married - or about to be. Yet not one possessed more grace or charm or loveliness than she. And as her birthdays crept gradually toward that tragic thirty-mark, marriage seemed farther from her life than ever. She was often a bridesmaid but never a bride. That's the insidious think about halitosis (unpleasant breath). You, yourself, rarely know when you have it. And even your closest friends won't tell you. Sometimes, of course, halitosis comes from some deep-seated organic disorder that requires professional advice. But usually - and fortunately - halitosis is only a local condition that yields to the regular use of Listerine as a mouth wash and gargle. It is an interesting thing that this well-known antiseptic that has been in use for years for surgical dressings, possesses these unusual properties as a breath deodorant. It halts food fermentation in the mouth and leaves the breath sweet, fresh and clean. Not by substituting some other odor but by really removing the old one. The Listerine odor itself quickly disappears. So the systematic use of Listerine puts you on the safe and polite side. Lambert Pharmacal Company, St. Louis, Mo." The 1920s were years advertising agents most focused their attention on identifying - often inventing - personal anxieties that could be resolved by the purchase of specific products. Listerine used their coined word, halitosis. The Lambert Brothers launched an ad campaign that played heavily on fears about how others would react to a halitosis sufferer. 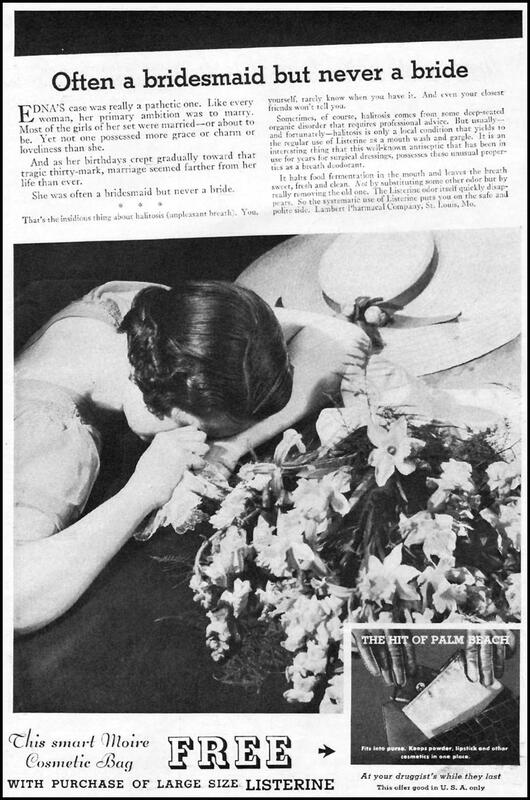 The most famous of their ads concerned the "pathetic" case of "Edna" who was "often a bridesmaid but never a bride..."
She was approaching the "tragic" thirtieth birthday unmarried because she suffered from halitosis - "a disorder you, yourself, rarely know when you have it. And even your closest friends won't tell you." The answer to halitosis was supposedly Listerine® mouthwash, an amber liquid packaged in a glass bottle.